The ultimate strategy game of pure skill. Conquer Europe by Grand Army and Battle Fleet. Double dealing, Deception and Danger dog every move. Simple rules - fiendish game play. 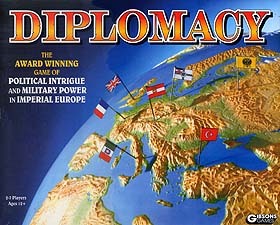 Secret Treaties, Broken Promises, Shattered Nations - all yours to exploit on your way to victory. I spent many long and happy nights playing this game at university. Combat resolution is as pure and simple as possible...whoever has the biggest number of fleets and armies in a battle wins. What makes this game magical is the diplomatic turn that happens before each set of movements and combat. Basically, to win you need to do deals with other players, but it is not generally in your interest to develop a reputation for being a back-stabber. If you do that, you find that you make enemies and other players will gang up on you. On the other hand, you are playing to win, so you need to employ lots of cunning. I know some pople who find all of that wheeling and dealing a little frustrating and even irritating, but I find it to be a huge amount of fun. The main problem with the game is that you really need plenty of time and at least 6 people to play it - it works best with the full 7. For that reason, pople who buy the game often end up playing it by email...and there are many web-rings devoted to doing just that.